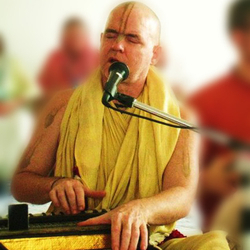 Aindra das received harinama-diksa on Nityananda Trayodasi in 1974 from A.C. Bhaktivedanta Swami daspada in Washington D.C. For many years, he was serving as a pujari at the temple and was regularly going out on harinama-sankirtana and book distribution in that area. 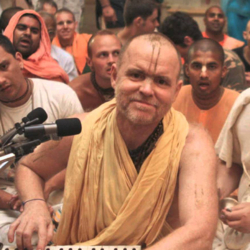 After several visits to Shri Vrindavan-dhama, he then got the inspiration within his heart to re-inaugurate the 24 hour-kirtan which had originally been established by Srila Daspada in 1975 at the Krishna-Balarama mandir. In 1986, Aindra das decided to settle down in Vrindavana-dhama and was coordinating and guiding the 24 hour-kirtan for 24 entire years! Not only did he inspire the local devotees and numerous visitors with his daily kirtanas, but his wonderful recordings and his most pure katha will eternally spread the mellows of Shri Vrindavan-dhama all over the universe. 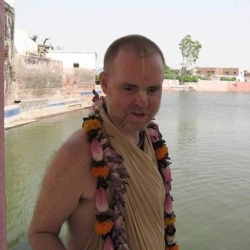 He left his body in the holy land of Vrindavan at the lotus feet of his Deities in his room beside Krishna-Balarama mandir on evening 16th July, 2010.